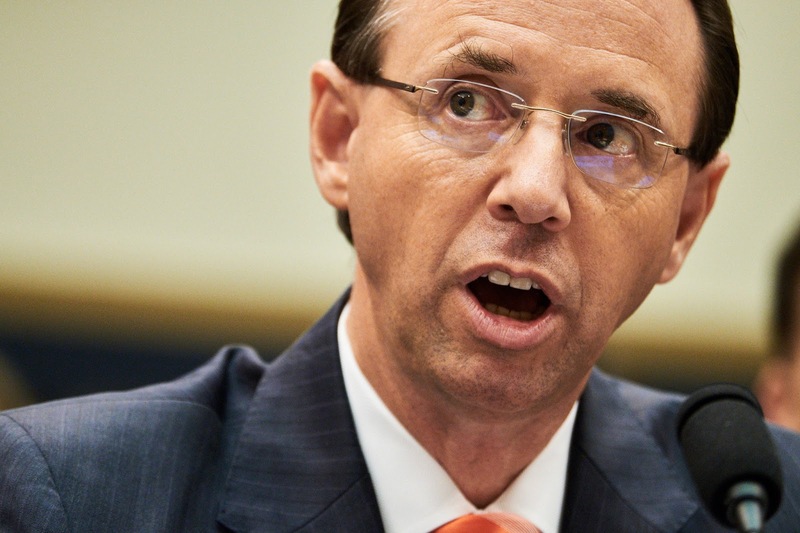 The Urban Politico: Deputy Attorney General Rod Rosenstein Wants to Remove Trump? Deputy Attorney General Rod Rosenstein Wants to Remove Trump? It's a stock cliche in sitcoms. Someone, either a hapless husband or a low ranking worker, makes fun of his termagant wife or vindictive boss. Everyone around him laughs. The newly minted comedian proceeds to make nastier jokes, do impressions, or sell wolf tickets about how if his wife or boss gives him any lip, he'll show his wife just who wears the pants in this family, knock his boss into the middle of next week, or tell his boss to take this job and shove it someplace that's difficult to remove. Unfortunately the man doesn't notice that his audience has stopped laughing, has drifted away, or is suddenly pretending that his jokes are offensive. Then the man turns around to see an enraged wife or boss standing there glaring at him. At this point the man pretends that he has temporarily lost his mind, claims to be his long lost twin brother, says he's in the wrong office/home or throws himself on the often non-existent mercies of his wife or boss. It's a funny cliche. Perhaps Deputy Attorney General Rod Rosenstein can appreciate the humor involved in this old bit. Maybe Rosenstein hopes that his boss, President Trump can find something to laugh about in the reports that Rosenstein was considering wearing a wire around Trump and attempting the modern equivalent of a palace coup. Rosenstein has denied the validity of this NYT report. Who knows. It could of course all be someone lying and hoping to goad Trump into firing Rosenstein and then presumably hiring someone who will fire Mueller. Or maybe it's all true. Perhaps someone has Rosenstein on tape or video saying and doing the things he now denies. We will see. Either way it shows that Trump doesn't inspire confidence or loyalty in some of the people who interact with him. Trump of course has the right to fire Rosenstein. If he believes these news reports he probably should.